I read this article and found it very interesting, thought it might be something for you. The article is called SAARC Summit: Making Friends Of Enemies and is located at https://archive.indiaspend.com/sectors/economy-policy/saarc-summit-making-friends-of-enemies-34032. 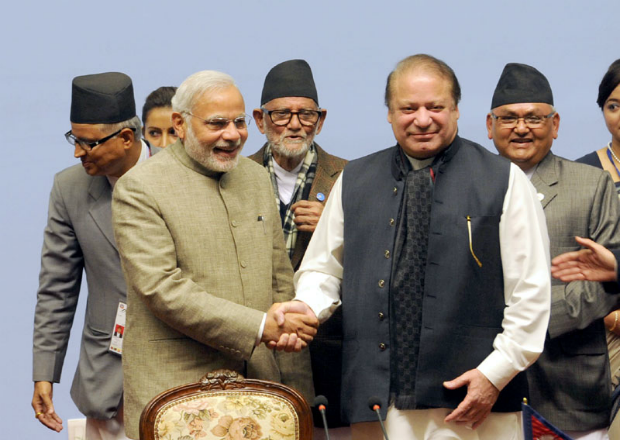 Apart from the photo-op between Indian Prime Minister Narendra Modi and his Pakistani counterpart Nawaz Sharif, the 18th summit of South Asian Association for Regional Cooperation (SAARC) nations held recently in Kathmandu, Nepal concluded on a disappointing note. No major deals could be signed as Pakistan held back from signing two key pacts; Agreement for Regulation of Passenger and Cargo Vehicular Traffic and SAARC Regional Agreement on Railways. The only pact that was signed was SAARC Framework Agreement for Energy Cooperation (Electricity).The Kathmandu Declaration highlighted “deeper integration for peace and prosperity” among member states. Some of the key features of the declaration are mentioned in the BOX below. In his speech addressing the regional leaders on 26th November, Modi emphasised economic cooperation and regional trade. He said: “Today, less than 5% of the region`s global trade takes place (among ourselves). Even at this modest level, less than 10% of the region`s internal trade takes place under the SAARC free trade area. Indian companies are investing billions abroad but less than one percent of that flows into our region.” Modi highlighted the role of free trade agreements between India and Sri Lanka which have strengthened relations between the neighbours. SAARC, a regional organisation including India, Sri Lanka, Pakistan, Afghanistan, Bhutan, Maldives, Nepal and Bangladesh, emerged in 1985 to promote cooperation on economic, geo-political and socio-cultural fronts. SAARC also includes 9 countries in the role of observers. Trade has played a key role in binding the SAARC nations together. In an effort to improve trade ties, the South Asian nations signed the South Asian Free Trade Area (SAFTA) in January 2004 during the 12th SAARC summit held in Islamabad, Pakistan. This primarily came as an initiative to transform the region into an economic union. The agreement came into force in January 2006, following which SAFTA Ministerial Council was formed comprising commerce ministers of the member states. The Kathmandu Declaration reaffirmed their commitment to achieve South Asian Economic Union in a planned manner through a free trade area, a customs union, a common market, and a common economic and monetary union. The total Free on Board (FOB) value of exports by member states under SAFTA has reached about $3 billion, or Rs. 18,600 crore (as on 20.09.2013) since launching the SAFTA trade liberalisation programme in July 2006. Let’s look at India’s bilateral trade with various SAARC nations. India’s total trade with SAARC countries reached $19.97 billion or Rs. 123,814 crore in 2013-14, up from $ 10.04 billion or Rs. 62,248 crore in 2009-10. Most of India’s regional trade takes place with Bangladesh, totalling to about $ 6.65 billion or Rs. 41,230 crore in 2013-14 and showing a growth of 14.99% from the previous year. The SAARC country that trades the least with India is Maldives with its total trade amounting to just $ 100 million or Rs. 620 crore. Bangladesh is India’s leading export destination among SAARC states with exports totalling $ 6.1 billion or Rs. 37,820 crore for 2013-14. India’s key exports to Bangladesh include cotton worth $ 1.57 billion or Rs. 9,734 crore. India’s exports to Sri Lanka increased 13.82% in 2013-14 compared to the previous year’s decline of 9%. It is interesting to note that India’s leading export to Sri Lanka is aircraft and spacecraft components worth $930 million or Rs. 5,766 crore. There has been significant growth of 52% in exports to Bhutan in 2013-14 whereas exports to Maldives are on the decline, falling 13% in 2013-14. India’s imports from its neighbours are much lower compared to its exports, which clearly reflect its “big brother” role in the region. Sri Lanka tops the list in terms of India’s imports with a total value of around $600 million or Rs. 3,720 crore. India’s imports from Maldives declined 37%, and also from Bangladesh (24%), Pakistan (21%) and Bhutan (7%). However, imports have seen a growth of 30% from Afghanistan and 6% from Sri Lanka. India’s trade balance with Bangladesh amounts to $5.68 billion or Rs. 35,216 crore followed by Sri Lanka ($ 3.87 billion or Rs. 23,994 crore) and Nepal ($ 3.06 billion or Rs. 18,792 crore). Trade among SAARC members may not be doing well due to tensions between the big two, India and Pakistan, stalling progress. The connectivity pact was an initiative towards strengthening trade relations among member states. The hope is that even a small improvement in trade will improve political relations and create a virtuous cycle that lifts every nation involved.